Larry Jacobs, founder of the Del Cabo Cooperative. Larry Jacobs, a visionary from California, pioneered a new form of agriculture three decades ago that demonstrated to skeptics food could be cultivated profitably without the use of farming chemicals and pesticides. He went on to found the Del Cabo Cooperative in Mexico, which continues to assist indigenous farmers in growing and selling their produce at a price that creates a sustainable livelihood for their families. 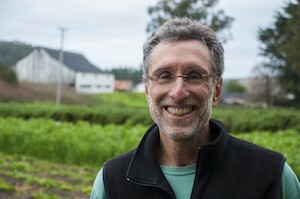 In part one of a two-part interview with Seedstock.com, Larry Jacobs, NRDC’s 2013 Growing Green Award winner, explains why he chose in 1980 to make the switch to organic farming. This occurred at a time when U.S. farmers who experimented with organic farming methods were not even on the radar screen, and were often considered residents of “Kookville,” Jacobs says. What was the impetus that led you to where you are today, as an organic-farming advocate? We’ve been farming organically since 1980. At that time there was no organic [produce] available and anyone that suggested you could grow crops without using the most modern chemical techniques thought you were just off the wall. But I had one of those life-changing experiences 10 years earlier, in the late 60s and early 70s, where I got pretty sick using a pesticide. That sent me down the trail of looking for ways of managing insects without pesticides. The end result is we’ve been farming without any of those chemicals since 1980. So that’s one big idea – it’s not revolutionary and a lot of people are doing it. We were maybe one of the first ones on the train at that time. And the other big idea in the mid-80s was that poverty is a bane on the planet. It’s a driver for social unrest, and it causes enormous health problems. A good part of the world’s poor make their living farming. What was the initial response to your efforts to farm without chemicals? Ourselves and a cadre of other individuals in the late seventies and early eighties — we didn’t take the adviser’s advice: ‘You cannot do this –You guys are nuts.’ And we went ahead and pioneered and looked for ways to solve these agricultural problems. That evolved into systems that eventually became acknowledged in the Organic Foods Production Act. How did your foray into organic growing lead to working with growers in Latin America? It took a long time for the public to acknowledge that organic food is best. There’s really something different [about organic produce] and we can certify that it is being produced according to whatever the guidelines are. They change a little bit here and there as the laws change. So we were at the early stages of that and then in the mid 1980s, [there arose] opportunities to use our experience in growing food organically for those markets that weren’t being filled in the wintertime. So we connected to growers in Latin America — a growing organic market — and thereby address this issue of poverty. At the same time, we spread that idea and the technology for farming and growing food without all these chemicals, which was counter intuitive to what local government officials were doing. What direction did the work in Latin America take? A big idea was early adoption of organics, and the other was using what we had learned to teach others how to do that. Now I work with over a thousand small shareholder farmers in Mexico and some in South America and Peru. The important metric is that it creates a change in annual income. In Baja, California we have measured that since we started in 1985, and most families that previously earn between two and three thousand dollars a year, now earn in the high twenties. The average is $30,000 a year and some families make much more than that. So it’s a tenfold increase in their income. Young men that were working in the U.S. illegally, are returning to their family farms, because they can make just as much money working with their fathers and the rest of their families in their communities. And they could work here without [Immigration and Naturalization Service] documentation. Del Cabo was a success story. Can you speak to that experience? It was a success story, impacting other people’s lives and creating income and economic opportunities for people that continues today. All the quality food that we market as Del Cabo is made up of all these little tiny farms all over Latin America that are aggregated under one label and aggregating whatever supplies they need going back the other way as well. They work together, and there are 14 or 15 different communities we’re in now. They buy materials, [produce] compost and get string for their tomatoes, so the aggregation has worked in their favor. How does being aggregated under one brand benefit the farmers? It goes both ways as they make markets for their products. And they have much better negotiations for materials they need to grow crops. The big plus is that many of these people have an understanding of what it means to be farming organically. They know the meaning of biological control, and they [now] understand some of the chemicals that people were selling to them previously had [negative health impacts], and that the basis for good food is healthy soil. So that’s a big win. The big philosophical point here is that for the last 60 years we’ve been growing food with what I call the Dr. Seuss paradigm: ‘The only good bug is a dead bug.’ And we’ve missed a huge opportunity to explore, understand and apply what nature’s had millions of years to figure out: How plants and the ecosystem manages to find a balance so that plants survive and the landscape is healthy. And, how to identify and create healthy landscapes, and also and how to mimic that in a more simplified system, where we’re potentially trying to maximize the amount of food we produce on a piece of land. Why is the issue of soil disruption such a great concern to you? We support the knowledge that if you’re trying to grow a crop of wheat or you’re trying to grow carrots or lettuce, you’re changing what was happening there previously. And, you’re trying to manage the system and by the very nature of doing that you’re disrupting things. You’re digging a garden, you’re putting a shovel in the ground and flipping the soil over and you’re disturbing billions of organisms that are living there. Or, if you’re driving up and down the field in a tractor and a plow, you’re doing the same thing on a bigger scale. You’re causing a huge disturbance. So our challenge is to figure out how to manage that disturbance in a way that produces healthy food in a healthy way. I’m a proponent of ‘let’s look to what nature does.’ Let’s glean and learn and extract and apply those lessons from nature to our farming systems. It’s never too late to start. Now is a good time. How have your views on soil disease led to improvements in soil amendments? We’ve been at that for the last few years — trying to understand what’s been happening in soils, to address soil disease. That has manifested in a couple of different products that we are now taking to farmers. One of them is a soil amendment made from different kinds of mustard meals. Mustard meals are the leftovers after you press the oil out of the mustard seed. As a soil amendment it has innate fertilizer properties and also adds some organic material to the soil. What we’ve been learning these last few years in this arms race between plants and insects, and plants and plants, is the mustard family evolved interesting chemistry, which defends the plant against insects. As a soil amendment, there’s added benefits to using these mustard meals, which we’ve developed and have been making here in Watsonville, Calif.
And, there’s added benefits beyond the obvious one as a fertilizer, as there’s a change in soil microbiology. [Mustard meals] have an impact on plant-disease causing organisms. Stay tuned for Part II of the interview with Larry Jacobs, a visionary farmer and founder of Del Cabo, in Pescadero, Calif, which will be posted tomorrow.